If you have a child with Aspergers who interacts well with animals, there’s no need to be surprised. People with Aspergers tend to bond more with animals than they do with people. In fact, many neurotypicals would see Aspies as animal whisperers due to how well they bond with animals. One time, we visited someone who is a gypsy and she owned some cats and dogs. Seeing as how I like animals, I began petting them and they liked it. When she saw that her animals had immediately taken a liking to me, she was surprised and said it was as if I had a gift where I can bond with animals. That scenario was a perfect example of how Aspies and animals are like bread and butter. I have a Yorkshire Terrier who I love to be around. I encourage any parent with an Aspie child to get them a pet that they would love to bond with. Whether it’s the classic dog or the trustworthy horse, having pets can prove to be very enjoyable for both the parents and the child. As a parent to a son with Autism, companionship was what I had desired for Sam especially during those challenging school age years. With no prospect of birthday party invitations or after school gatherings, I worried (turns out far more than I needed to) for Sam’s emotional needs. To this day, Max (pictured above with Sam) offers just the right amount of support. Animals will seemingly listen and not judge you based on your social skills or designer apparel labels. You can vent your troubles, remain in total silence for hours or hug them and their tail is still wagging the next day! I can recall, as a little girl, moving to a new town where families had been established as friends for generations. Coming in as a middle school student had its social challenges even for a neurotypical! Compounding the isolation, I developed a near fatal form of pneumonia where I was functioning with only one lung for weeks. It was at this point that I met a stray German Shepherd mutt that changed everything…my newfound confidant, Nellie Jean. That dog walked me to the bus stop every morning and was there waiting for me upon my return. Our walks in the nearby woods, rides on the tractor and adventures that mirrored much the book Because of Winn-Dixie afforded a lonely, gangly girl unconditional friendship. Companionship is a fundamental need in all of us. However when diagnosed with Autism, Asperger Syndrome or a social disorder, companionship might be difficult to come by…especially in the early years. Consider a pet to fill in those gaps, whether for your school-age child or for yourself as an adult. Adjust your choice of pet to fit your means whether financially (hamster to horse) or geographically (apartment to suburbs) just so there is a pet to care for…and to care right back. I have aspergers syndrome, I need help from any reliable source that can help. I have one dog, I have devoted my life to the study of canines. I have found that I can understand dogs and can hold a conversation with them, It is hard to find good sources on this. Main idea:One of the downsides of aspergers is that aspies don’t pick up on most social que’s despite high intelligence, I have noticed an unusual connection between those with asperger syndrome and animals. Some aspies seem to be able to understand animals, they read the body language, social ques, and energy of animals like most people do with each other. Below I will put my hypothesis, I will also have sources edited together to support my hypothesis. P.s. I have aspergers. Hypothesis: Aspies can understand animals because asperger syndrome protects the primal part of humans and develops it taking from encounters with animals, the growth of the primal part does not stop the growth of the rest of the mind. 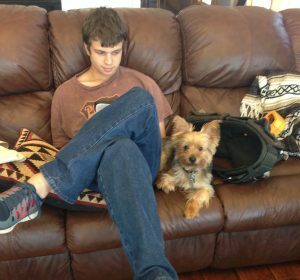 Donovan, I am one of those you describe with Asperger’s and an ability to communicate woth dogs. I have shelves full of dog books, have taken classes on puppy development and socialization, read every book I can afford on dogs and have had dogs in my life since childhood. I am one like you describe that can communicate with animals. Case in point: I went into a yard where two of my dogs were, a golden retriever and a poodle. The golden, Duffy, ran over to the tree, looked at the ground, then jumped back, then looked at me to seenif I got it. I said ”A snake?” He immediately ran and crouched and looked under the rock wall. I said”It went under the wall?” He looked at me like he was pleased I understood. I could not find the snake. My family thought I was nuts when I told them that Duffy told me there was a snake in the back yard and it went under the rock wall. The following day I had to take the poodle to the vet because a Copperhead snake bit him in the mouth in the same back yard. Then my family were not sure exactly how a dog could communicate that to me. They don’t get it. I do. Hello, I’m Serena. I’m someone who has Asperger’s as well. I must confirm your hypothesis as I have numerous examples of canines coming to me. my uncles dog, who’s name is shadow, is a wonderful example. Unfortunately, my uncle doesn’t understand shadow and they simply don’t get along. Shadow runs away from my uncles and always ends up at my house on our porch. He tells me he doesn’t like it at my uncles house and that he wants to live here, but I can’t take him in. Sometimes he’s under the porch when it rains. I had a similar incident with my neighbor’s dog, buck, who is normally a wanderer but really old. He got lost, found my house and stayed the night on the porch (He doesn’t have issues with his owner). I ended up walking them home both times. My son is 13 and has Aspergers. He is very anxious about time keeping and constantly checks the time especially at school? Any advice Please? I am looking at buying him a dog to try and eliviate his anxiety?